Henley Rowing Club took home the victor ludorum trophy from this weekend’s Upper Thames Autumn Head race with a haul of 16 wins across all senior and junior events. With a gusting headwind making life difficult for crews throughout the day, the Henley club took to the event in force and came home with 16 wins and a further 12 second places in the 69 event competition. 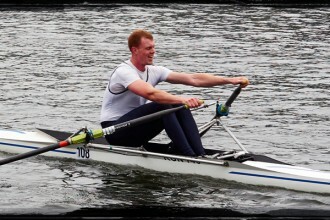 The senior and junior men’s squads had several wins with the IM3 double of Stan Admiraal at bow and Andy Pettican at stroke recording the fastest double of the day. The Masters pair of Mike Jennings and Rob Wilson took a further win. It started well for the J15’s in the morning with a second and fifth place in the doubles and was followed with a win in the afternoon coxed quad event. The crew of Anthony Howe, Bruce Turnell, Jack Broadbent, Joe Zolkwer and coxed by Lachlan Reid got off to a powerful start overhauling the Great Marlow School in the first 800 metres and then pursued the Falcon Rowing Club crew closing the gap to finish 8 seconds clear with a strong and determined performance despite a gusty headwind. The J14 coxed quad of Connor Brown, Oliver Taylor, Tom Crook, Jack Spiers, and cox Joe Edwards completed the course in 13 minutes and 26 seconds, finishing one and a half minutes ahead of second place Great Marlow School. The J14 double of Jack Spiers and Tom Crook competed in the afternoon division and scored a second victory over Great Marlow School. The senior and junior women’s squad was affected by overnight illness, leading to some reworking of crews to compete. However, the squad took a further 11 wins for the Henley club. The two Henley WJ14 coxed quads dominated their event on home water. The wining quad of Ella Nolson, Livia Peterson,Jessica Arlett, Felicity Parfitt and Emeline Warner as cox held off a determined challenge from Emma Gray, Phoebe Fletcher Sophia Hahn, Amelia Crick and Esther Morgan as cox in defeating them by 8 seconds, beating crews from LEH and Falcon RC by a considerable margin. 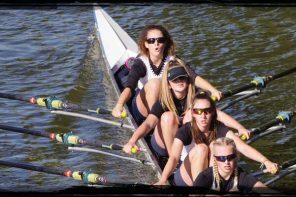 The junior women’s quad of Alicia Redman, Georgina Robinson Ranger, Katy Claridge and Ella Wandless raced eight other crews to win the Women’s Novice event, beating the University Of Oxford lightweight women’s and University of Reading boat clubs. 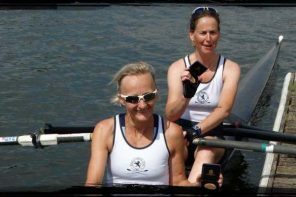 The newest members of the Henley junior women’s squad also formed a Novice Eight and achieved a highly commendable second place against the much older and more experienced boat from Thames Rowing Club. WJ15 sculler Mary Wright stepped in to cover illness to race three years up with Ellie Thompson in the WJ18 doubles, winning against 7 other crews. In the WJ16 doubles event, the Henley squad took first and second place, with Florence Wiggins and Ella Morgan beating their club counterparts Clare Pearson and Lauren Kay. 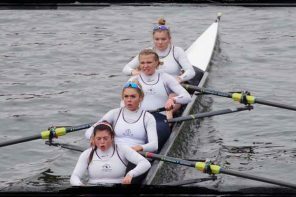 The WJ16 coxed four of Maisie Turner, Georgia Edwards, Hannah Gutteridge, and Lily Morgan beat Lady Eleanor Holles School Boat Club and two other crews comfortably in a time of 13 minutes and 4 seconds. Other event wins for the Henley club came for the WJ16 quad, WJ18 coxed four, WJ18 quad, WJ15 coxed quad and both the Women’s IM2 coxed four, and Women’s IM2 coxless four.